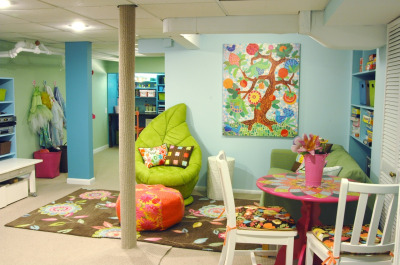 A converted basement makes a fabulous space for a playroom. If you want to get inspired on how to take a basement from drab to fab, check out how Jessica Levitt of Juicy Bits created this amazing playroom. 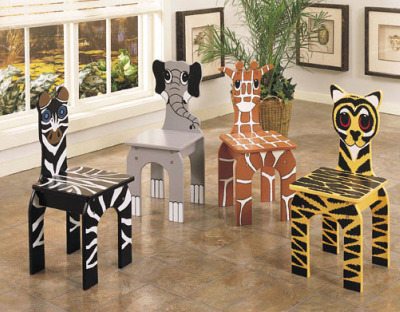 Your kids will love to get into the safari theme with this set of four animal chairs. These chairs are silk screened with animal patterns of a zebra, tiger, elephant and giraffe. Get the set of four chairs at onewayfurniture.com for just $135. 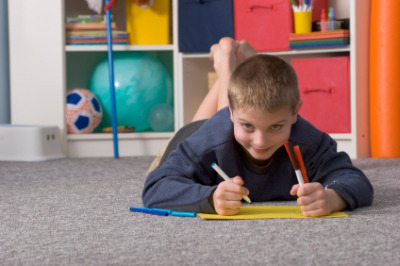 Encourage your little ones to read by giving them their own library playroom. 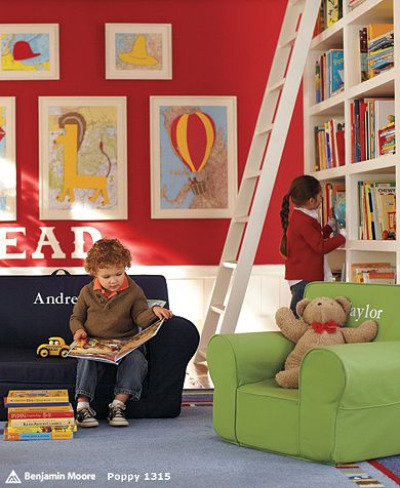 Pottery Barn Kids offers the furniture, wall art and decor you need create the perfect reading playroom. Huge wall murals add some drama and fun to your kids’ playroom. 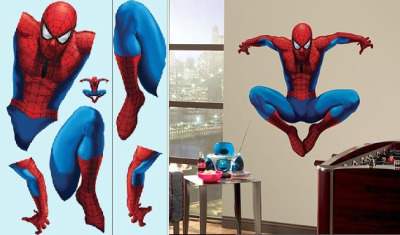 Get this Spiderman giant wall mural at wallstickeroutlet.com. 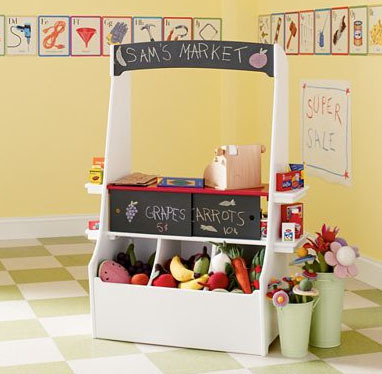 Boys and girls will both love setting up a little market in their playroom. The Shop ‘Til You Drop Market features roomy bins and a chalkboard sign. You can find this market station and the accessories at landofnod.com. For your little girls playroom, create a pretty pink kitchen. At Pottery Barn Kids, you can find a pink retro oven, icebox, sink and kitchen accessories. 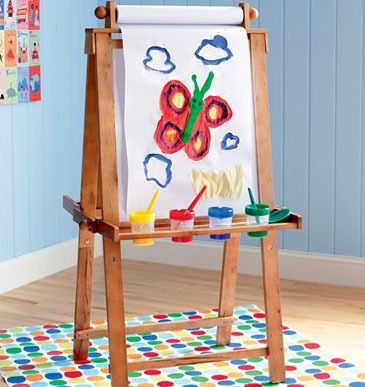 Create a fun playroom for your little artists with this free-standing easel. This easel has a white laminated board and paper roll on one side, and a chalkboard on the other side. It also has trays for paints, chalk and more. Get the Easel Does It at landofnod.com for $129.00. 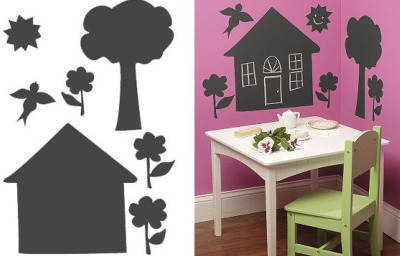 Vinyl chalkboard panels can peel and stick to your walls to create fun decor. These Wallies Peel & Stick chalkboards come in a variety of themes and colors. They are removable and repositionable. Get them now at wallstickeroutlet.com. Your little girl will adore this dollhouse bookcase and everything else you need to create a dollhouse themed playroom. Furniture and decor available at Pottery Barn Kids. 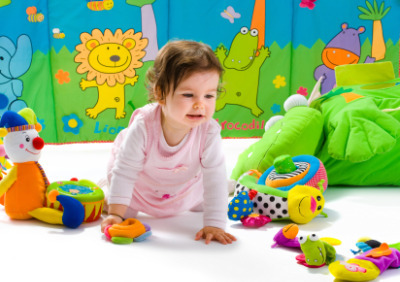 For toddlers, create a very colorful playroom with wall hangings, murals and paintings. Fill the room with soft toys in bright colors and prints to stimulate their desire to play. 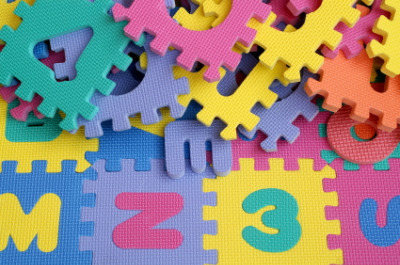 By using letters and numbers in your playroom decor, you’ll encourage toddlers and preschoolers to learn. These colorful foam puzzle pieces join together to create an ABCs and 123s play mat for your playroom. Keep your playroom clutter-free with cubbies and built-in shelving to organize sports equipment, toys, art supplies and more. 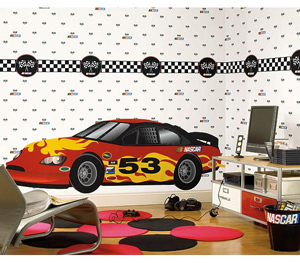 Create a race car themed playroom with this Nascar racer mural and the check borders. Find these and many other wallpaper murals at thatsmyroom.com. Jen from I Heart Organzing created a tremendous space for kids in this perfect play haven. 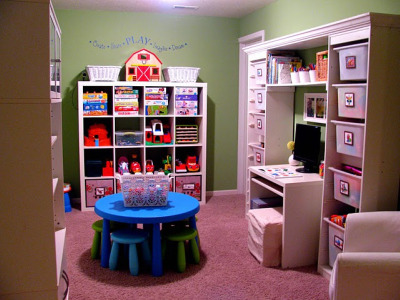 This playroom features plenty of book and toy storage, a computer space, wall art and much more. Add a circus border around the room and decorate with stuffed circus animals. You can get the circus train border and other accessories at thatsmyroom.com.